Very Good. Trump: The Art of the Deal by Schwartz, Tony, 2015-10-06. Trade paperback (US). Glued binding. 384 p. Contains: Illustrations. Very Good. Trump: The Art Of The Deal by Schwartz, Tony, 2004-12-01. Mass market (rack) paperback. Glued binding. Contains: Illustrations. Good. Trump: The Art of the Deal by Schwartz, Tony, 2015-10-06. Trade paperback (US). Glued binding. 384 p. Contains: Illustrations. Good. 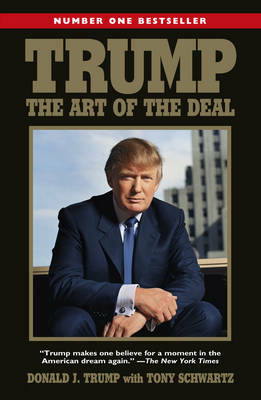 Trump: The Art Of The Deal by Schwartz, Tony, 2004-12-01. Mass market (rack) paperback. Glued binding. Contains: Illustrations. Donald Trump made his deal with Ideal Health and is now called The Trump Network. This company is in Pre-Launch and is just starting to leak out to the public. The official launch of Trump Network will be November 13, 2009. I believe this will be the legacy he leaves with all Americans. It's time to pull ourselves together and ?opt out of the recession?! I believe that Donald Trump's plan to teach you how to get rich will work.